When you make use this easy but authentic New England Clam Chowder recipe, you'll realize what "perfection" means: fresh clams, potatoes, cream, milk, bacon. . . the ideal soup for cold winter nights, summer evenings at the beach, and every time in between. New England clam chowder (we pronounce it "chowdah") can be found in practically all Boston restaurants, pubs, and seafood markets. A cup of clam chowder is like a taste of Boston. A bowl of chowder is a satisfying meal. 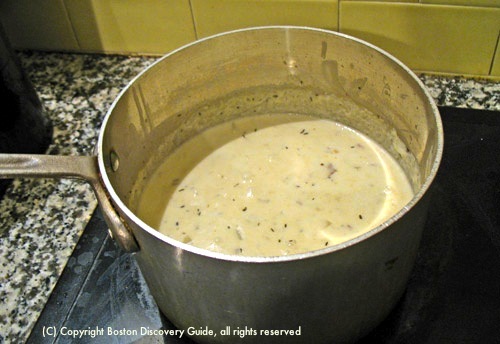 So if you've ever wondered how to make clam chowder, you'll be happy to know that this New England cuisine favorite is very simple to make - one of the easiest and fastest of all Boston and New England recipes. With this recipe, you can enjoy New England clam chowder anytime, whether or not you're in Boston. Most people in Boston and elsewhere in New England who make clam chowder have their own "secret" recipe . . . and of course, so do I, except that it's not really a secret since I'm about to share it with you. My recipe uses fresh clams and gets its thickness from just a little bit of flour, plus starch from the potatoes. Once the clams are scrubbed, prepped, and steamed (which only involves a total of about 5 minutes of actual effort), prep and cooking time for the chowder is about 15 minutes or less if you multitask a couple of the steps. Once you do this a couple of times, it begins to feel effortless. You can also use shucked clams (clams that have already been removed from their shells) if your fish market has them. But in case steaming and chopping fresh clams sounds too time-consuming, or your fish market doesn't have shucked clams, or you simply don't have time to run to a fish market for fresh clams, don't worry - I'll also tell you about a short cut using canned minced clams. 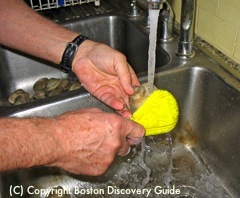 Scrub each clam with a stiff vegetable brush. This is the hardest part about this recipe, so I always get my husband to do this. He claims it's not hard at all. That's him scrubbing the clams in the photo. 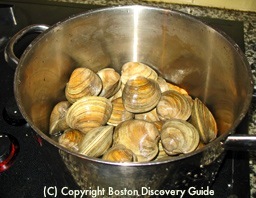 Put the clams into a large soup pot and fill it with cold water. 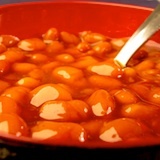 Mix in 1/4 cup salt and 1 tablespoon cornstarch. Let the clams stay in this solution for 1 hour to get rid of any sand. Rinse the clams under running water and put into a large colander to drain. Thoroughly rinse out the soup pot, put the clams back in, and add 1 cup water and 2 of the bay leaves. Cover the pot with a tight-fitting lid, and place the pot over medium high heat to steam the clams for about 15 minutes. Most of the clams should be completely open - throw away any that aren't. Use the tongs to put the rest of the clams into a bowl. Strain the liquid left in the bowl through cheesecloth or a fine-mesh strainer into the smaller bowl. You'll have maybe 3 cups of what is called "clam liquor" - the liquid from cooking the clams. Put it aside. You'll use some in this New England clam chowder recipe, and can freeze the rest for future use in seafood bisque or seafood chowder. When the clams are cool enough to handle, remove them from their shells. Chop them into small pieces - about 1/4" dice is good. If you're using shucked clams, all you need to do is chop them into 1/4" dice - no need to steam first. 3. Prepare the chowder base. While the clams are cooling, rinse out the large soup pot one more time. Put it back on the stove over medium heat. If you're using salt pork, cook it until the fat is rendered. If you're using bacon, cook it until it's almost crisp. Add the diced onion, the remaining bay leaf, the thyme, the pepper, and the butter. 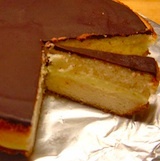 After the butter melts, sprinkle the flour over the other ingredients, and stir to blend in the flour. After the onions become translucent, add the reserved clam cooking liquid, the diced potatoes, and milk. Bring to a boil, stirring fairly frequently, and then reduce the heat. Simmer until the potatoes are tender - usually about 8 - 10 minutes. Stir once or twice as the potatoes simmer. While this is happening, I usually chop the clams (Step 2). 4. Add clams, cream, and season. Add the clams and the heavy cream. Bring just to a simmer, and then cook for 2-3 more minutes. Do not overcook, or the clams will become tough and rubbery. If you're using shucked raw clams, don't worry - this cooking time works for them too because you chopped them into small pieces that cook quickly. Taste the chowder, and then add salt, white pepper, and perhaps a dash of cayenne until you get the right balance. Serve the chowder in cups or bowls. Sprinkle about a teaspoonful of parsley over each serving if you'd like. Traditionally, New England clam chowder is served with plain white crackers locally known as "oyster crackers." You can substitute whatever kind of crackers you like, or even slices of French bread. True, using canned clams won't give the same results as fresh clams - but the resulting chowder is very good - especially when the other option is no chowder. In fact, a lot of restaurants use canned clams in their chowder, so you may not even notice the difference. If you decide to go this route, skip Steps 1 and 2 of the New England clam chowder recipe. Start with Step 3. 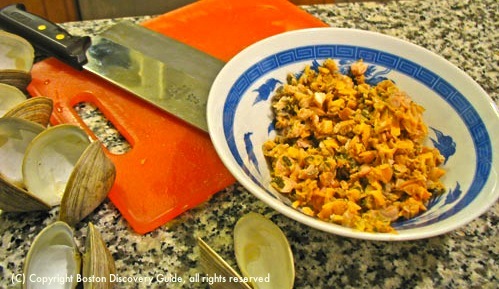 Simply substitute 2 cans of minced clams and one bottle of clam juice for the fresh clams and reserved cooking liquid. Alternately, you can use cans of chopped clams, although sometimes they're a little rubbery. Even though I prefer chowder made with fresh clams, this version is good enough that canned minced clams and bottles of clam juice are staples in my pantry. 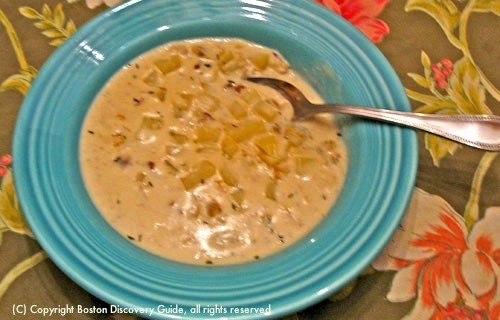 "Spirited" Chowder - Add a teaspoon of sherry to each bowl of chowder right before serving; stir to mix in. Add more than a teaspoon and the coldest winter night will begin to seem warm and cheery. You'll begin to love winter. Vegetable Chowder - No clams? Skip Steps 1 and 2. Start with Step 3, and simply substitute 2 cups of diced veggies (carrots, corn, sweet red peppers, and/or green peas work well) for the clams, and chicken broth or milk for the clam cooking liquid. 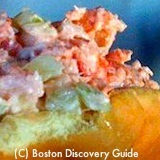 The Perfect Excuse to Visit Boston: Chowderfest! Who serves the best clam chowder in Boston? This is a burning question here, and every year the city's top chefs compete for the winning title in our local "Clam Bowl": Chowderfest. You get to sample chowders from all the city's best restaurants and pubs at Chowderfest - and then vote for your favorite. Boston chefs spend all year trying to perfect the winning recipe - and trust me, everyone wins because Boston has the best chowder in the entire nation. Chowderfest is part of Harborfest, Boston's huge Independence Day celebration. 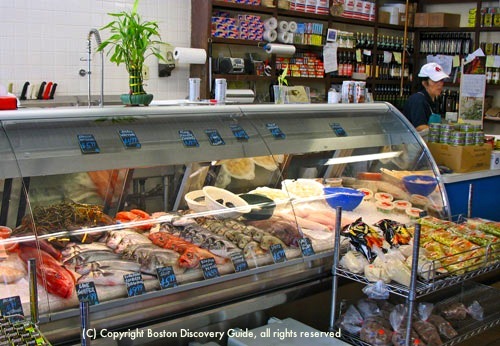 What to Know More about Seafood in Boston?